Before you get started on a do-it-yourself PC, you have to select the components that you are going to use. Some of the things you will need to make choices about are listed below. If you are planning to use some of your current hardware in the new PC, that may limit some of your choices with the other items listed. The place to start is with the processor. All processors have advantages and disadvantages. The main types of processors on the market right now are Intel’s Pentium 4, Pentium III and Celeron and AMD’s Athlon, Duron and Athlon XP+. Personally, I like AMD’s Athlon XP+ for its price and performance. You choice of processor will help decide which motherboard you can use; manufacturers use differing pin layouts on their CPUs. There are many websites that can help you choose a motherboard. Some of my favorites are Tom’s Hardware Guide at http://www.TigerDirect.com, http://www.TomsHardware.com and AnandTech at http://www.AnandTech.com. The interface specifications of your hard drive(s) can influence your motherboard choices. For example, currently the fastest hard drives support the ATA/133 specification, but not many motherboards support it. So if you want one of these drives (and want it to work in ATA/133 mode) then your motherboard needs to have ATA/133 controllers or you will need to add a 3rd party IDE controller. I need to add here that most motherboards have 2 IDE ports that can support a maximum of 4 IDE or ATAPI devices (2 per cable). If you want to use more than 4 Hard Drives, CD Drives or Zip drives then you will need more than 2 IDE ports. You can either add a 3rd party IDE controller or purchase a motherboard that has an IDE RAID controller (it adds 2 additional IDE ports). RAID stands for Redundant Array of Inexpensive Disks. RAID controllers are pretty cool; in their IDE implementation, they usually support RAID 0, 1, 0+1 and JBOD. RAID 0 means that the disks are striped, meaning that they appear as one big disk to the Operating System, but are written and read from alternately for speed. 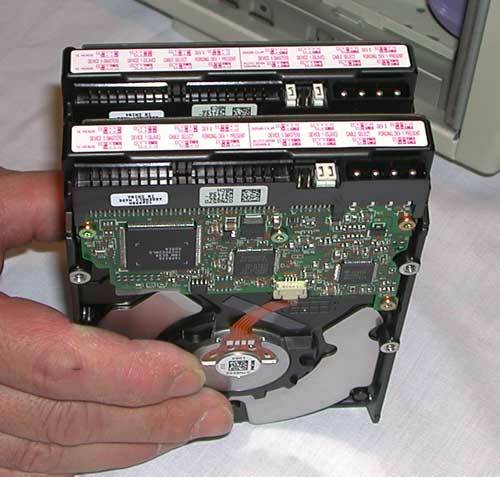 RAID 1 means that two drives are mirrored and the same data appears on both. RAID 0+1 means that two drives are striped and then another drive or drives mirrors the striped array. JBOD (Just a Bunch Of Disks) means that multiple drives appear as one huge disk to the operating system. Now we come to RAM. Your motherboard choice will determine what kind of RAM you can use. For more information on RAM, you can read my article RAM, RAM I Need More RAM in Volume 2 of ABC. The next component on our list is the Video Card. If you are a gamer, you probably already know what video card you want. A good 3D accelerating Video Card can cost more than a processor. Currently the fastest Video Cards are available in AGP versions only. Make sure that you check with places Tom’s Hardware Guide and AnandTech before you make your Video Card Choice, some motherboards may have a problems with certain Video Cards. CD/DVD ROM and CDRW drives - Get the fastest you can. If you are planning to copy from CD to a CDRW make sure that you have 2 drives (1 CD/DVD ROM and a CDRW) it makes life a lot easier. Sound Card – Match your sound card to your real needs. It is very easy to go overboard and purchase features that you will never use. Network Card - Get at least a 10/100 card. The 10 Mb cards are roughly the same price. Modem – Either buy an external modem or make sure that your modem has a controller. Controllerless modems (also known as WinModems or soft modems) use your CPU to process data being sent and received and therefore are less reliable and slow down your PC. Last but not least are the case and the power supply. For all modern PCs, I recommend a high quality power supply. If you are building an Athlon based PC, AMD has a page with power supply recommendations. For the case, it is possible to get a $30 case that includes a power supply, but I can’t recommend them. The power supply is usually very low-end and may not provide enough power. 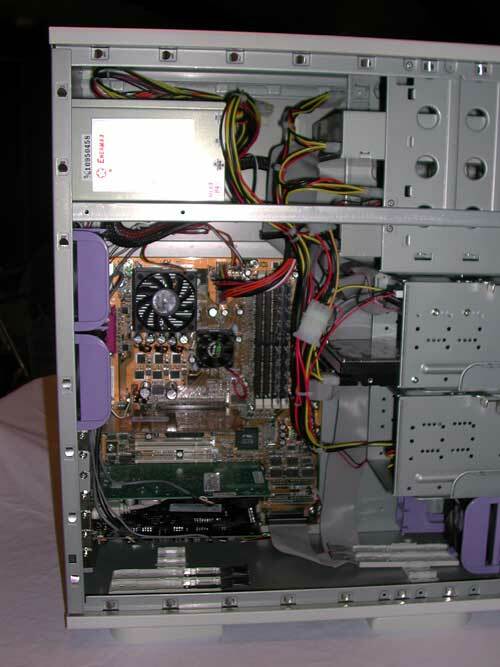 Cheap cases also usually have sharp edges, poor hardware layout and may not provide adequate cooling. If you’re building your own PC, you will be much happier (and have fewer cuts on your hands!) if you go with a quality case. For all components I recommend that you go with major manufacturers with well-known names. It is a good idea to ask around and see if, in general, people have had good or bad experiences with the specific items you’re interested in. I would also make sure that items you are interested in have drivers for, and are supported in, your choice of an Operating System. I used 3 PCs in the following pictures, one is the test box that I used for the article on Windows XP in Volume 6 of ABC and the other 2 were being made for customers. I would like to thank both Ross Johnson and Martha Bagwell for allowing me to use their PCs for pictures in this article. Now that you’ve chosen the components lets start building! Caution!!! You need to worry about static electricity. Use an antistatic strap or an antistatic mat. If you accidentally zap one of your expensive components, you may have to replace it. mount the mounting posts in the matching holes in the case. Now mount the power supply in the case. Make sure you have the orientation correct. 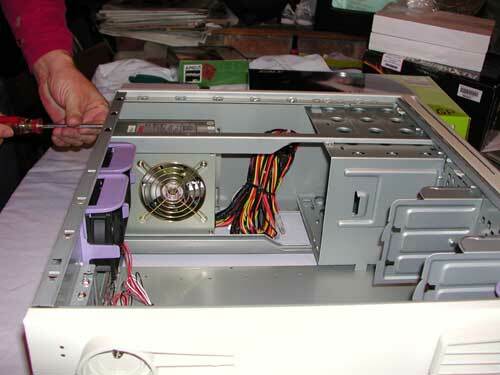 Remove the blanks covering the external bays for the Floppy, CD/DVD ROM, CDRW drives. With some cases you need to remove the case front to get at the blanks. It should look like this when you’re done. 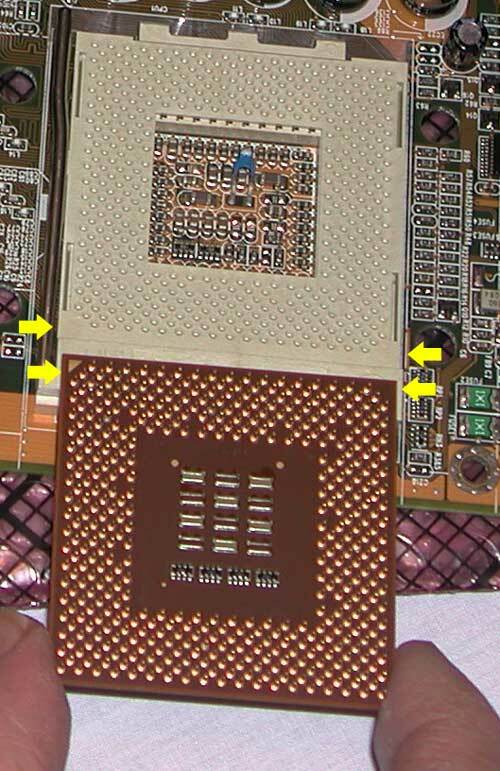 First mount the processor, paying close attention to the orientation of the processor relative to the motherboards socket, the following picture shows the clues for an Athlon processor, note the “flat” corners. 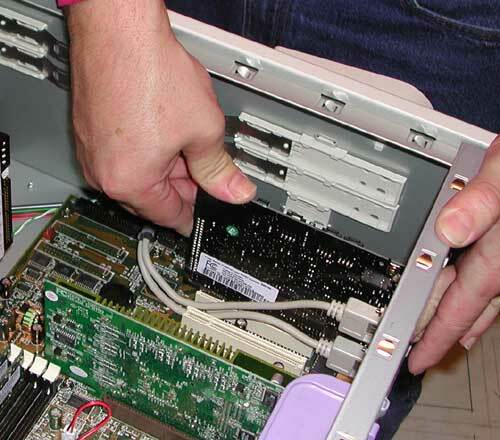 To install the processor, lift the locking lever and carefully place the processor in the socket. Gently push the processor down and close the locking lever. Check your motherboard manual for jumper or dipswitch settings. You may have to set jumpers that determine the CPU speed and type and even the voltages used by the processor. Most of the motherboards I use are jumperless and these settings are handled by the BIOS. Install the processor cooling fan. Before you install the processor fan you need to make sure that there is thermal paste between the processor and heat sink. Personally I prefer Artic Silver. All you need is a thin layer of thermal paste. If there is a pre-made pad on the heat sink, you can remove it with alcohol. Just make sure that you remove all traces of the pad and that the alcohol is completely dry before you mount the heat sink and fan. 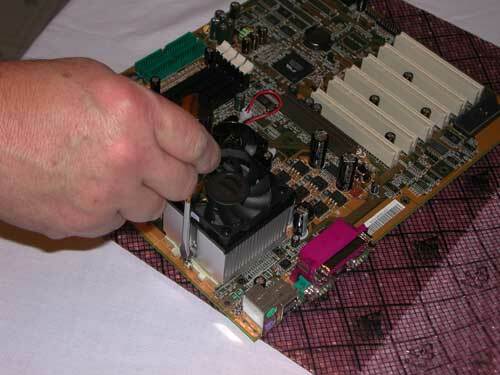 Be very careful installing the heat sink and fan, follow the manufacturer’s instructions. Now install the memory. For details see my article on RAM in Volume 2 of ABC. Take your time with this step. 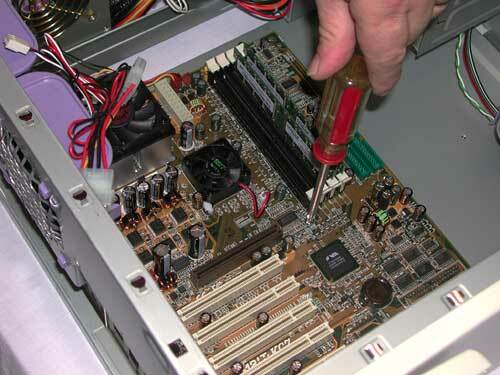 Line up the motherboard with the template on the back of the case and press it into position. If doesn’t want to move into place DON’T FORCE IT. Take another look and slowly put it into position. 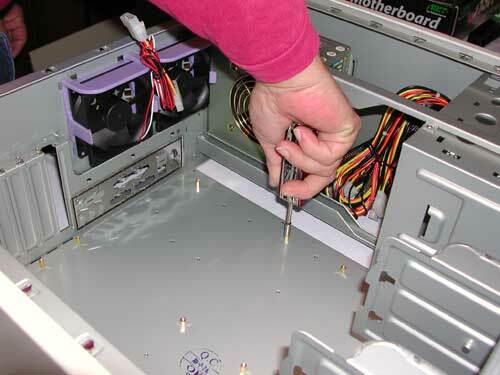 Make sure that you don’t damage the motherboard by sliding it along the mounting posts. After it is positioned, attach it to the case with mounting screws (a high quality case includes all the hardware you will need). Gently tighten the screws a little past finger tight. 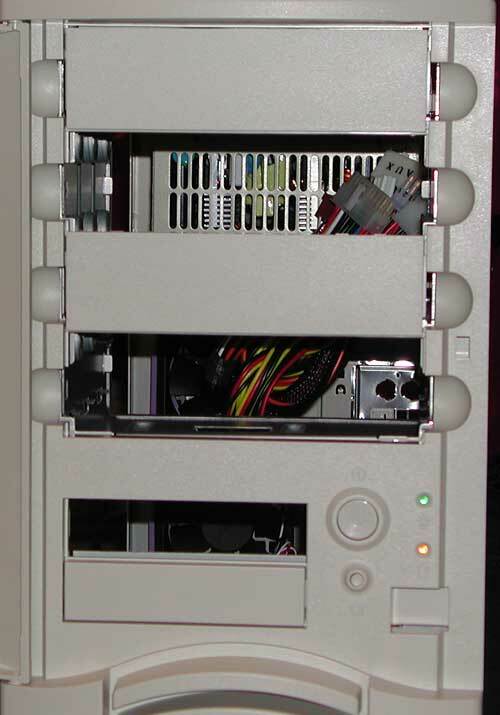 My preferred cases use drive rails to mount 5 ¼” drives like DVD ROM drives. Simply attach the rails to the drive. 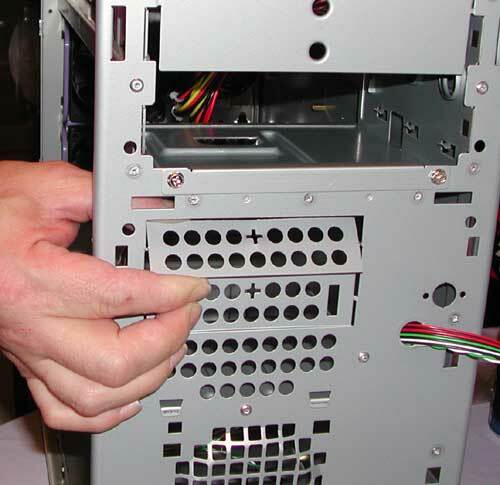 If it doesn’t line up with the front of the case, adjust the position of the rail relative to the drive. Before you install the drive you will need to check the jumpers. IDE drives can be jumpered one of 4 ways: as Master, Slave, Stand Alone or Cable Select. Not all drives have the Stand Alone position. If you use cable select, your motherboard, drives and cable all must support it. On non-Cable Select systems, if you are using a single drive on an IDE channel it must be jumpered as Stand Alone or Master. If you install two drives, one must be a Master, the other a Slave. 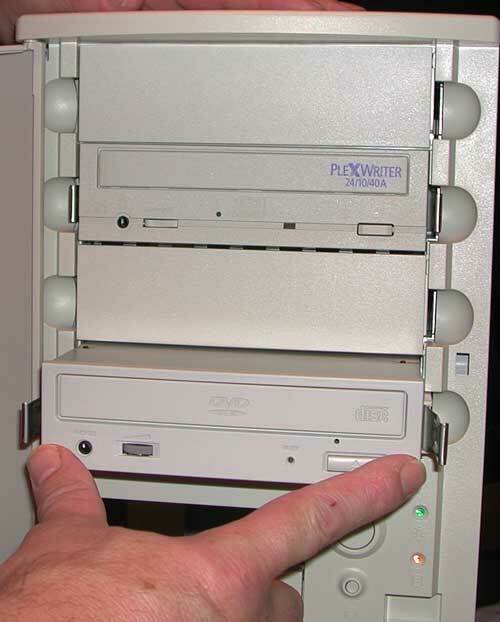 When you’re ready to install the 5 ¼” drive, you just slide the drive into the case from the front. For floppy and hard drives I prefer cases that use removable drive cages. 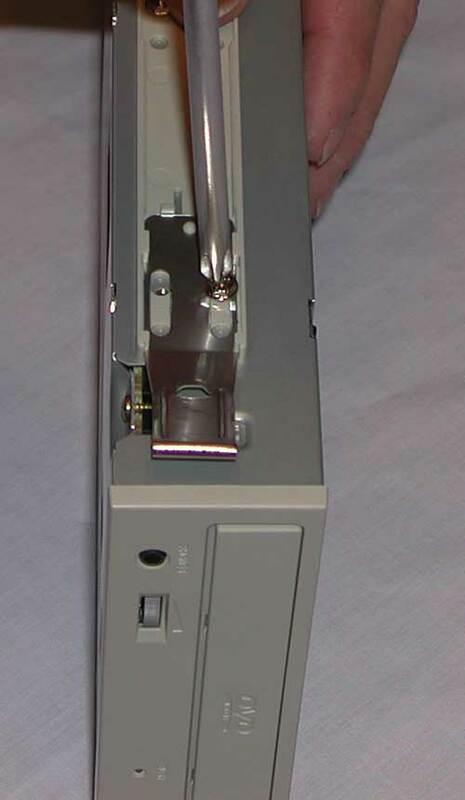 Again, if the front of the Floppy drive doesn’t line up with the front of the case, simply adjust the drive in its cage or bracket. For the hard drive(s), again, it must be jumpered like any other IDE device. 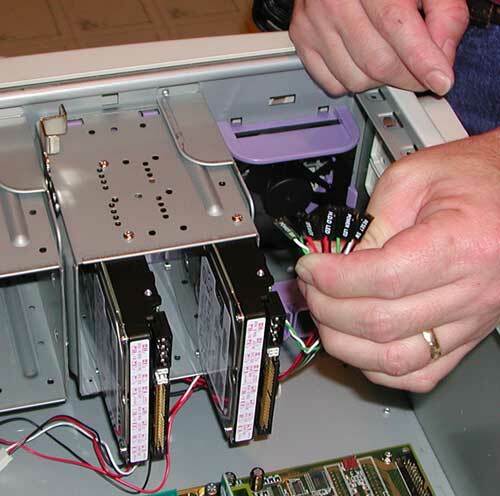 After you have the drives mounted in their cage(s), install the cage(s) into the case. Connecting Wires to the Motherboard. 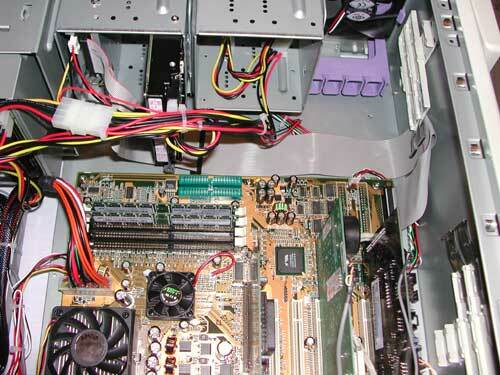 You need to connect the motherboard to the case; most cases have a small bundle of wires (that are hopefully labeled) that need to connect to certain pins on the motherboard. These control the Power Switch, Reset Switch, Speaker and front panel lights. Now it is time to use the motherboard manual to determine where they go. Now install your peripherals cards. 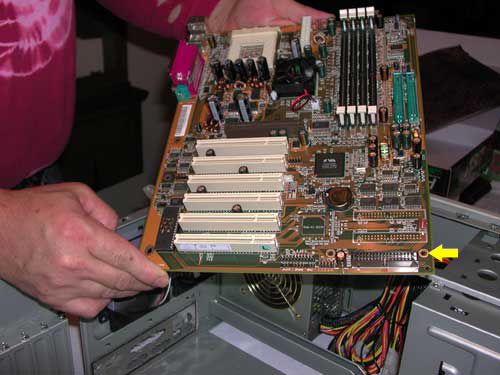 Before you start, check your motherboard manual for a PCI IRQ map. Try not to install cards in slots that share IRQs. If you must share an IRQ, avoid slots that share an IRQ with the AGP slot or the IDE controller(s). 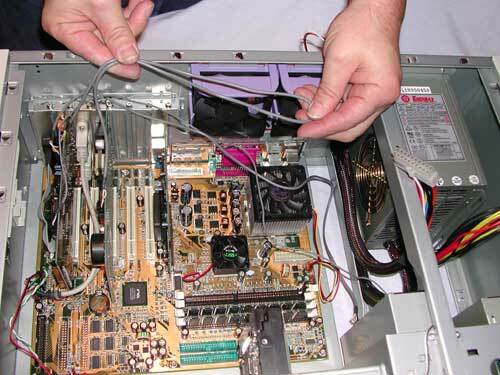 There are lots of wires inside a computer connecting various items. There are so many they can have serious impact on cooling performance. 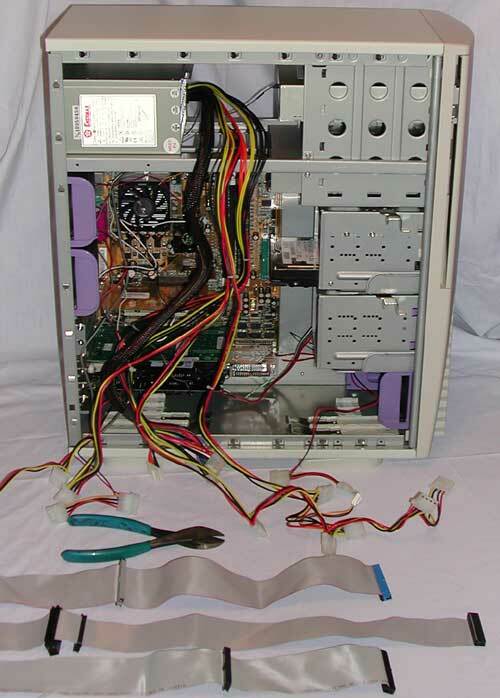 A haphazard cable layout can interfere with proper airflow inside the computer. Most cases are designed to have air enter the bottom front and exit from the top rear. 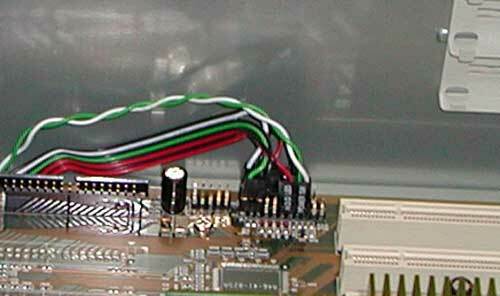 When wiring IDE devices, make sure the Red wire on the IDE cable is at pin one. Pin one is usually next to the power connector. Make sure that you use 80 wire IDE cable to achieve ATA/66 speed or better. The IDE Master should be at the end of the IDE cable, the Slave in the middle with the blue connecter (for ATA/66+) on the motherboard. Don’t forget to run audio cables from the CD/DVD drive and the modem (if using a voice modem) to the sound card. Don’t forget to connect the power cable for the Power Supply to the motherboard. When you run the IDE cables, think Origami (yeah, paper folding) to get them out of the way of the air flow. Remember that air should flow from the bottom front of the case to the top rear. When you’re done you should see a clean path from the bottom front of your PC to the top rear. Connect a Keyboard and Mouse, Monitor and a power cable. Insert a bootable floppy disk in to drive A:. Now, you’re ready to boot the PC. Turn it on. Go into the BIOS settings and adjust them to the requirements of your new PC. Make sure that you have it set to boot from the floppy. Save and exit the CMOS Settings and allow your PC to reboot. 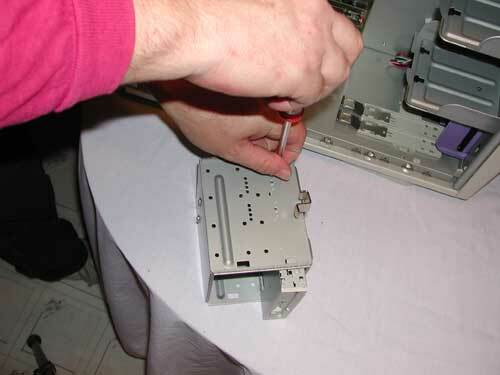 If the floppy drive doesn’t work, try reversing the drive cable (move the red line to the other side of the drive). If the PC won’t power on, try reversing the orientation of the power switch connection from the case. The same trick also can help if the LEDs on the front of the case aren’t working. If everything is working, close up the case and admire your new PC. You can now make it useful by installing an Operating System.